Chancey Operations in Shujai'ya: Changing the boundaries, or a farewell to humanity? We couldn’t recognize Shujaiya. It was like a tsunami of bullets had struck the area. Or a blazing earthquake. Something natural but disastrous. But what really happened was beyond nature or even humanity. It was like the 1948 Nakba all over again, with scenes similar to the 1982 Sabra and Shatila massacre. There were flashbacks to the Cast Lead masssacre of five-and-a-half years ago, too. 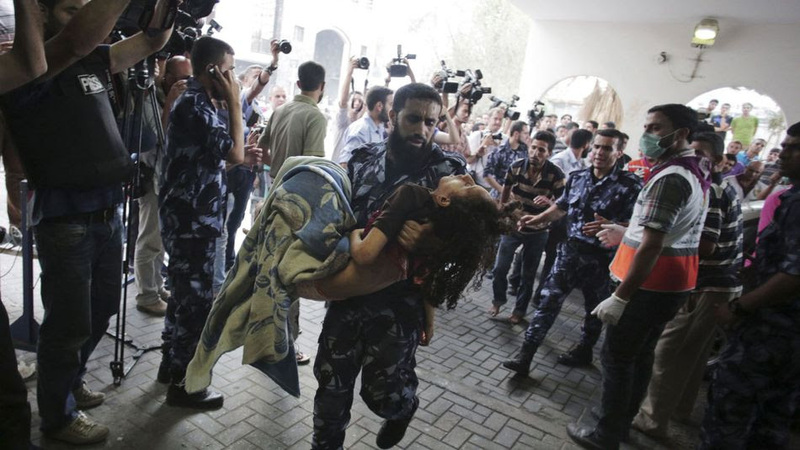 Medics managed to pull out 72 dead Palestinians, their bodies splayed across the streets. More than four hundred injured people were taken to the hospital. Medics say that the numbers of the dead and injured may increase dramatically. Can you imagine the devastation of a father who is holding his child dead in his hands? Can you imagine his loss? And how ashamed and guilty he feels for not being able to protect his child? On 11 September 2005, when the last Israeli soldier left the Gaza Strip, ending 38 years of military and civilian rule, no one seriously thought that this withdrawal could be reversed, that Israel might one day come back and control directly this narrow and densely populated piece of land. For most Israelis, Gaza was considered always something between a nuisance and a nightmare. “For my part, Gaza may drown at sea,” said Prime Minister Yitzhak Rabin right after the Oslo agreements, reflecting the long-time Israeli dream to get rid of Gaza and its refugee camps, a constant reminder of the 1948 war that never really ended. In the decade that followed the unilateral withdrawal, Israel was not able to forget about Gaza. Operations Cast Lead in 2008 and Pillar of Defense in 2012 were just the picks of an almost continuous violent confrontation: 15,000 rockets and mortar shells fired from Gaza into Israel, thousands of Israeli air strikes and few dozens of “targeted killings”, occasional ground incursions into the Gaza Strip and a practical Israeli siege on Gaza from land and sea. The Mavi Marmara incident in May 2009 was part of the enforcement of this siege. Although locked behind fences and walls and free of Israeli settlers, Gaza was always at least in the back of Israel’s mind. Yet until some two weeks ago, the option of reoccupation of the Gaza Strip and reinstatement of Israeli rule was off the table of Israeli decision makers. To support it was considered political suicide. Operation Solid Rock (the English version Defensive Edge does not convey the original meaning of the words in Hebrew) changed all that. For the first time since 2005, such an option is not discarded offhand. Politicians support it openly, senior military experts endorse it and even the public seems favourable. In a poll published today in Israel’s Hayom newspaper, 77 percent oppose a ceasefire in the current situation and 65 percent think that the scope of operation “Solid Rock” should be the overthrow of Hamas’s rule in Gaza, something which will be almost impossible to achieve without full control over Gaza. How did this change of mind come about? The continuous firing of rockets into Israel, 16 days into the conflict, did play a part. True, only two civilians were killed and due to the effectiveness of the Iron Dome system, there is no real panic among Israeli civilians, but life is disrupted, especially in the southern parts of the country. Absence from work rose from 6 percent in the beginning of July to 33 percent two weeks later. The fact that the army admits its inability to stop these rockets certainly does not help Israelis to feel reassured. In the same poll, 68 percent estimate that there is a slim or zero chance that rocket launching will stop when the operation is over. The tunnels -- which were dug under the border between Gaza and Israel, and from which dozens of Hamas fighters keep emerging almost on a daily basis -- played a much bigger role. Not only did they allow Hamas to hit Israeli soldiers in their own territory, they pose a psychological threat which is difficult to cope with for the residents of the nearby kibbutzim and cities. The fact that the enemy could pop up any moment from under the ground is conceived as a sort of nightmare. These feelings explain the huge majority in support of the ground operation, whose official goal is still to detect and destroy these tunnels. The relatively high losses, 27 soldiers killed up till this morning, serve only to strengthen the will of the army and public to prove that they did not die in vain. Naftali Benet, who leads the hardliners in the cabinet, went as far as threatening to break down the government if a ceasefire were to be signed before the full destruction of all tunnels in Gaza. But it seems that the real reason lies deeper. “The story of repeated deterrence rounds just does not work,” says Dr Gabi Sidoni, retired colonel and head of the programme on Military and Strategic Affairs in the Institute for National Security Studies (INSS) and one of the drafters of the Dahiya doctrine, which is based on deterrence. “The result of every round is that Hamas is getting stronger. It surely got stronger compared to Cast Lead. You put a fence, and they come underneath. It is a problem we cannot live with, it cannot be accepted.” Therefore, according to Siboni, there is no choice but to “go in and clean Gaza” from Hamas. Tuval Diskin, ex head of the Shin Bet, who only recently criticised the Netanyahu government for creating an illusion that the status-quo could go on without a political settlement with the Palestinians, expressed similar views in Yediot Ahronoth today. Israel has the ability to widen its ground operation in to populated areas, claims Diskin, and even stop completely rocket launching into Israel. Hamas will fight fiercely and might inflict a “painful price” on Israel, but its ability to resist a direct confrontation with Zahal is weaker than expected. The conclusion: “without such an operation, a problematic status quo situation will be created, whose meaning is continuous blood shedding with no ability to win”. While there is no doubt that if Israel chooses, it can reoccupy Gaza as, at least for now, it seems that the Israeli public is ready to “pay the price” in human lives and economic losses. Unfortunately, it is certainly ready to inflict a terrible price on Palestinian lives, whether they are military activists or civilians. Contrary to the massacre in Sabra and Shatila in 1982, the huge number of dead bodies in the streets of Sjaja'ia did not have any substantial effect on Israeli public opinion. So far it seems that international public opinion, helped by Egypt’s hard line against Hamas, is not openly anti-Israeli, if not supportive in many cases. This, of course, may turn upside down, but it is evident that Israel feels it has a “window of opportunity” to do things it did not dream to do before. Siboni says that the “cleaning” may take a few months, even a year or more. Two and a half years passed between Operation Defensive Shield in which Israel took over the cities of the West Bank in 2002, till the end of the second intifada. But provided that the international community and the Arab world will allow Israel to repeat this model in Gaza, and provided that the West Bank will remain relatively calm and that the number of Israeli casualties will not make the public change its mind about the war in Gaza, the huge question which remains is what Israel will do with Gaza the day after. Siboni is saying that Israel will have to choose between reactivating the military administration in Gaza, cancelled after the withdrawal in 2005, or handing it over to President Abbas’s government, after crushing Hamas’s ability to govern and fight. The terms of this transfer of power are not really clear. Diskin is offering a detailed model of demilitarisation of the Gaza Strip. The deeper the demilitarisation would be, the more the siege on Gaza would be lifted. We are still very far from full reoccupation of Gaza by Israel. There is little doubt that such a move could lead to terrible bloodshed. But what is interesting in this change of heart of the Israeli establishment towards Gaza, in this readiness to reoccupy it even at the cost of many Israeli lives, represents an understanding that Israel cannot keep on running away from Gaza, that Gaza will not drown itself in the sea of its own free will. After years of negation, Israel finally admits that Gaza could not be separated from the West Bank, that there will be no solution to the Palestinian problem without a solution to the problems of Gaza. Is this not what the people of Gaza, and even Hamas, wanted all along? Is this not the reason they didn’t settle for the Egyptian “quiet against quiet” formula? What is sure is that the Gaza war is changing the map of the Israeli-Palestinian conflict. Meron Rapoport is an Israeli journalist and writer, winner of the Napoli International Prize for Journalism for a inquiry about the stealing of olive trees from their Palestinian owners. He is ex-head of the News Department of Haaretz, and now an independent journalist. Our foremost concerns are not only the health and safety of the people in our communities, but also the quality of their lives -- their ability to live free of fear of imprisonment without due process, to support their families through gainful employment, and to travel to visit their relatives and further their education. Likewise, Hamas represented the sentiment of the vast majority of residents when it rejected the unilateral ceasefire proposed by Egypt and Israel without consulting anyone in Gaza. We share the broadly held public sentiment that it is unacceptable to merely return to the status quo -- in which Israel strictly limits travel in and out of the Gaza Strip, controls the supplies that come in (including a ban on most construction materials), and prohibits virtually all exports, thus crippling the economy and triggering one of the highest poverty and unemployment rates in the Arab world. the serpent's coil came full circle. Darwish's poem was written in Lebanon. It documents the 1976 siege and massacre at Tal Al-Zaatar during the Lebanese Civil War. Tel al-Zaatar (The Hill of Thyme) was a UNRWA administered Palestinian Refugee camp housing approximately 50,000-60,000 refugees in northeast Beirut. 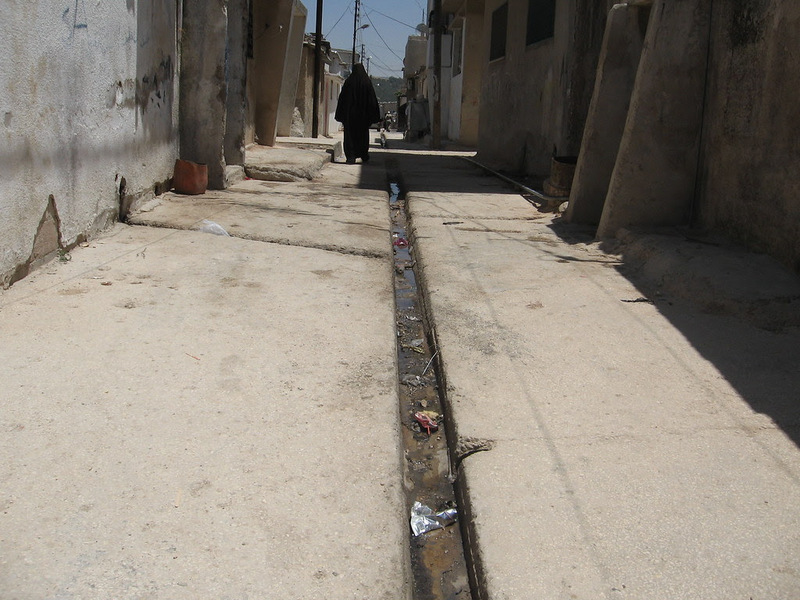 Fadwa Tuqan's poem was written in Nablus, where she lived and died. Not even an hour now. Nothing as empty as that (excepting certain promises). Tom, Thanks for your continued attention to this escalating tragedy--if that is even the right word. The compositions of photographs, poetry and dispatches take me closer than any news "coverage" I know of. I am struck by the image of the little girl running in the alleyway in Gaza in 2009, carrying a container of water, I suppose in each hand. Why is was she running then? Where is she now? 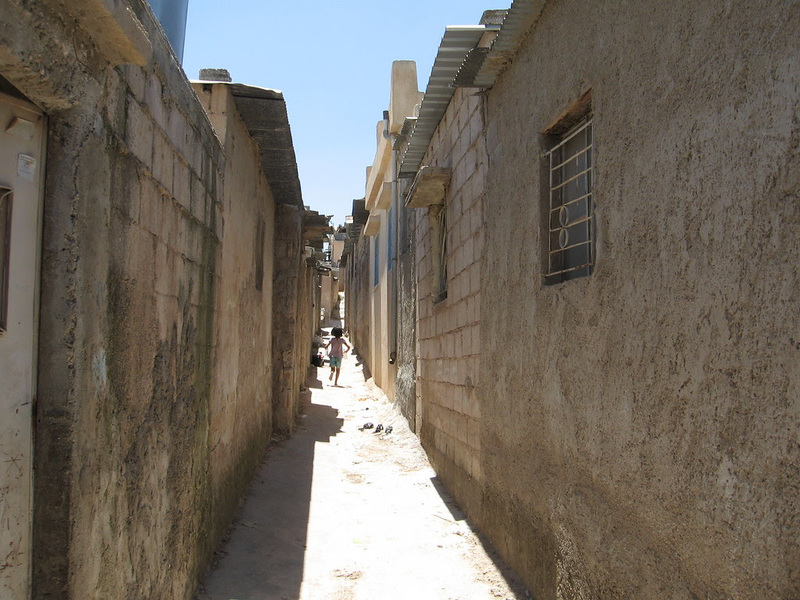 The two lowest photos come from the Gaza refugee camp in Jerash, Jordan, where thousands of people displaced from Gaza by the 2008-2009 offensive fled. The identical caption appears with both shots; I've placed it with the final shot. The photos were taken by UN relief worker. They reveal the horrendous conditions in the camp; when the IDF reiterates its self-congratulatory claims of maximum restraint, and suggests that those in Gaza ought to simply go away to escape the horror, places like this -- designated foreign ghettos -- are what they mean. And at this point the designated ghettos are all full up, the roads closed, travelers blown up on sight. So even the miserable subjugation of a refugee camp is beyond the means of most vulnerable Gazans at this point. And it's very hard too imagine such a thing as an invulnerable Palestinian, at this point. No, not even an hour now. Sometimes it's ten minutes, sometimes five. Sometimes the "knock on the roof" (warning shot), sometimes nothing at all, no warning, people overcome by exhaustion daring to doze a bit and -- a tank shell blows up the building. From hell to eternity for those within. So many of the mutilating wounds now requiring amputation. The fellow who says he supposes "we'll be scarred for life", perhaps an understatement. A war without laws conducted by beings to whom international law does not apply. Scarred for life, yet again. While the overwhelming mass of "spectators" turn away -- death and destruction spiraling up, media buzz trending down. Most of what is said and seen in the place where this is happening is never seen or heard in the outside" world -- that place in which, as the Gazans know all too well, they were forgotten long ago. They've had to go it alone, increasingly. Their ordeal has produced pain and suffering and loss on an inconceivable scale. It has also produced great poetry. Fadwa Tuqan was twenty four years senior to Mahmoud Darwish. Their specific experiences differed. Their cause was the same. To me, both are great poets who speak of the things that matter in a language and with a credibility inaccessible to journalism or editorial. In the exhaustion of the past two weeks and of the attempt to represent in a balanced way the images and words from the center of this historical tragedy, it would be inevitable that I've overlooked or misrepresented this or that bit of the larger picture. If so, apologies. It's a cottage form of "coverage" motivated by the desire to allow others' awareness of what I've learned. Hopefully some will be finding it of use. Certainly it can not be sustained for long. Nor, one would have assumed, based on the past, can the killing. One is constantly being brought up short now by the realization that all previous assumptions concerning the capacity of "civilized societies" to excuse, deny and wish away, largely out of social constraint, the palpable sufferings of and blatant injustices committed more or less routinely against a people whose place in history is coming to seem unique -- the forgotten, who will stubbornly not forget, and finally can never be forgotten. And yet, the reality, very little we can do or say from this distance that might be heard without shouting down. Worse still, not that much being done or said, at that.